Among our many innovations, our passions have driven to the development of in-retro-visual sensory perception. Pilot project, concepts for the reintroduction of our species, the homo sapian, to cosmic interactivity. For most of us it's been many years since one has seen the heavens. 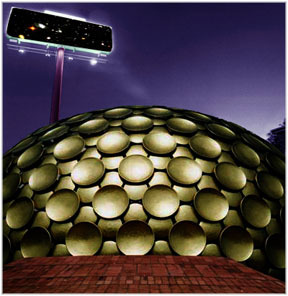 Our cosmic billboard project has taken hold in many cities across the country reingaging humanity with the cosmos. Minimal advertisement, Minimal footprint and Minimal impact on our consumption habits while providing us awareness of our cosmic role in the greater scheme of things; another green mall concept. From Cosmic Dust to Strip Mall, the use of matter in some parts of the universe has taken on the self-organized palor of unrestrained comerce, a commerce that inherits nothing from the galactic economy but to consume for the sake of consumption -- a neurotic need to make more because less is not an option. These economies are driven by a species that just swung from the tree, a species that just a few years ago could barly rub sticks together to make heat; now our social, political and economic fabric has soured the fundimental reasons for existence. Cosmic Signs are a small step to bring back the night, celebrate all this sensless beauty without giving up any bargains . With strip mall light polution at an all time high, Cosmic Signage will keep us in touch with our better angels. Scari Development will keep you in touch with your cosmic origins through Celestial Bulletin updates. If there are cosmic happenings of interest, we will update you no mattter where you shop, no matter how distracted you get by the next big product, your values can remain grounded in your personal survival strategy (enhancing your kit) while retaining a cosmic place in the universe. Auroville cosmic signs, Auroville one with the Universe, electric with Orb Energy. At 3:00 o'clock in the morning Auroville is lively and active with worship and prayer for the City of Future. Orb Energy is palpable at this hour. Night is our Love, Signs are our Passion, Orb Energy is proved to hold links to the beyond. Newly installed Celestial Sign in Auroville, India. The Matrimandir Temple of the Golden Orb is an early adopter to Cosmic Signage. Through interferometric data stream interpolation, Cosmic Signs are bringing back the night all over the world. Given the importance of evening worship, Auroville has plans for an additional fifteen Celestial Signs to ring the community  "Now Worship, Meditation, Feasting and Dancing can be a 24 hour enterprise, and those long hugs can last even longer." 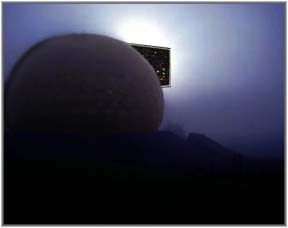 UNESCO funding casts new light to the International Order of Auroville, the Energy Orb and the mystical disbursal of funding for an imagined reality of the future. Powered by solar arrays dotting the landscape, the signage is charged by day and discharged by night, balancing the new celestial order and comforting the citizen's need for security. 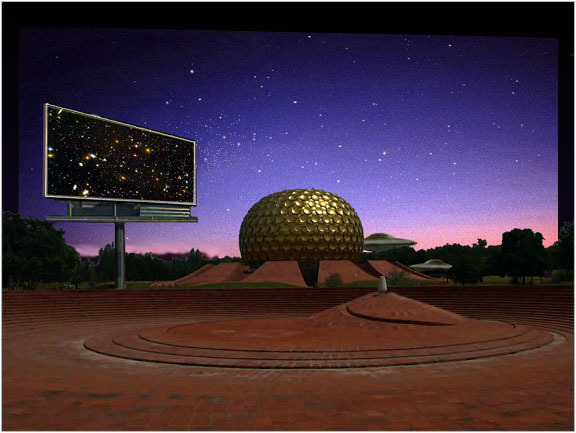 Cosmic Signs are a natural evolution of spiritual awareness; the arrays are received with favor by the peasents and tribals living in the land beyond the Auroville Boundary, many of whom are now learning to read from the ambient light provided by Auroville's vision for the future. He, the Dalai Lama being but one Buddhist among many Buddhists in McLeod Ganj  he is the autocrat, democrat of McLeod Ganj.